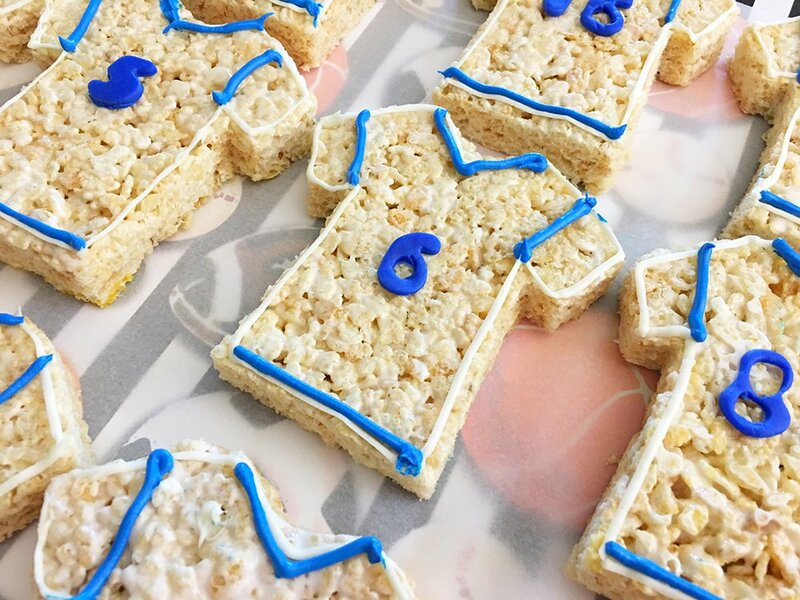 Sports Jersey Rice Krispies Treats are the perfect dessert or snack for a game day party. They’re as much fun to make as they are to eat! G and I have been glued to the TV these past weeks following the historic comeback of the Dodgers to the World Series and our game day eats have been as much fun as the games themselves. 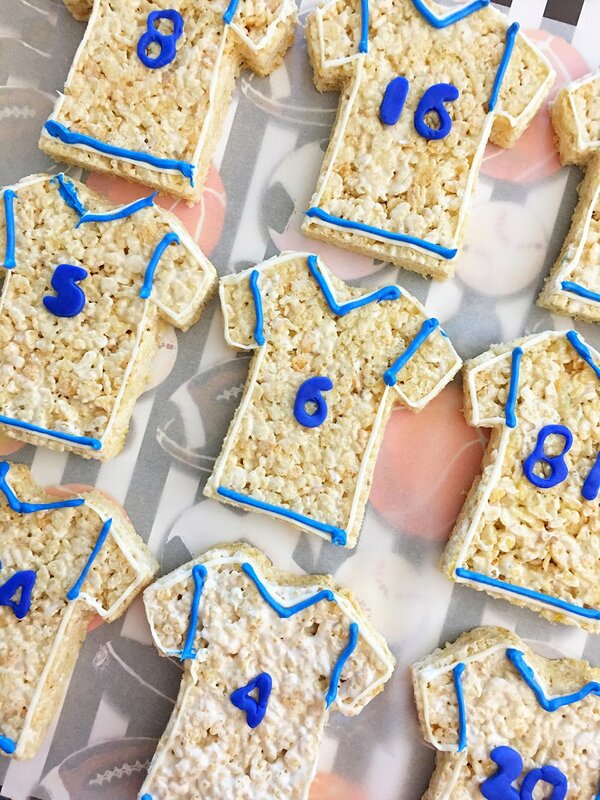 I didn’t think anything could top the sweet and spicy chili tenders from yesterday but these Jersey Rice Krispies treats proved just as popular. 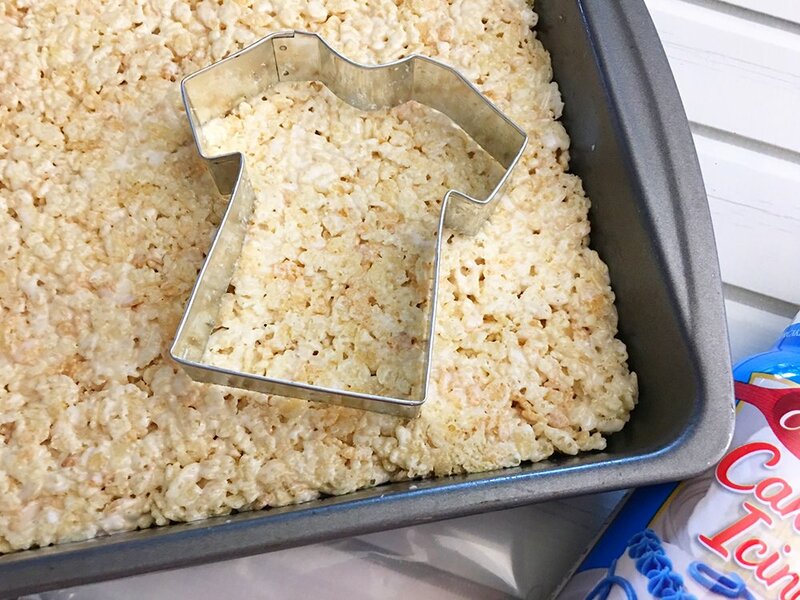 Transfer the prepared rice Krispies treats into a greased pan and press it down on until firmly packed and leveled. Allow to set and cool for about an hour. 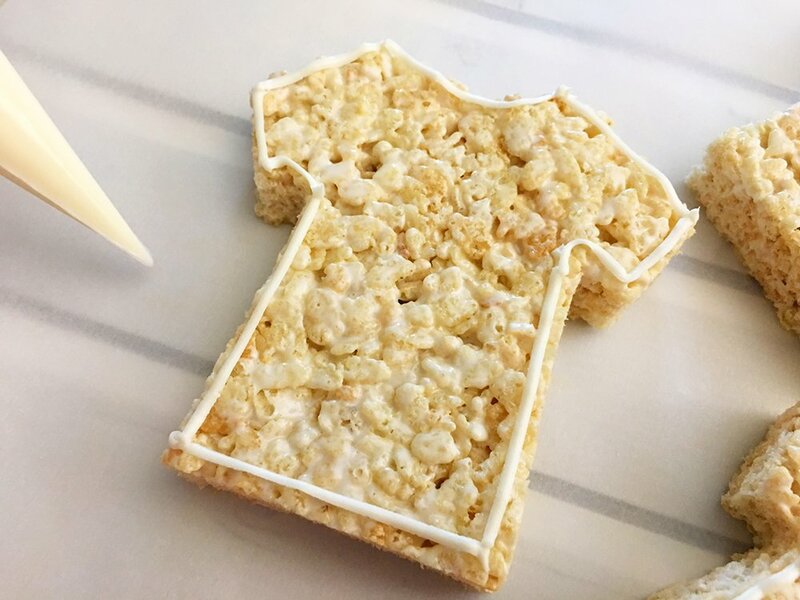 Using a jersey cookie cutter, cut the Rice Krispies into shapes. Place cut Rice Krispies on a flat work surface lined with a sheet of parchment paper. Fill the decorating bag with vanilla frosting and cut a small tip off the end of the bag. 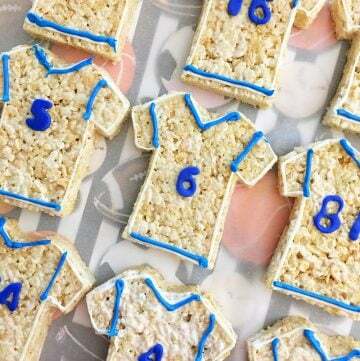 Outline the jerseys with the vanilla frosting. Roll out the blue fondant in between two pieces of parchment paper and use number cookie cutters to cut out the jersey numbers. 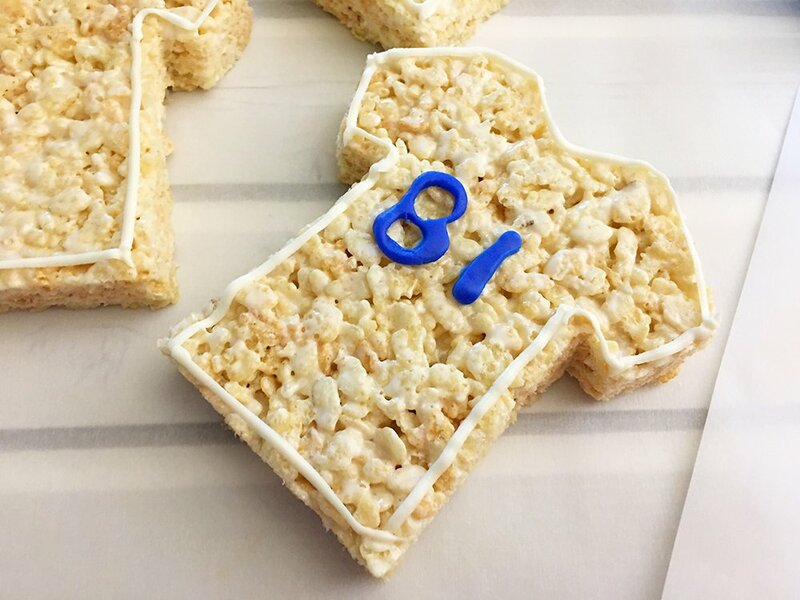 Arrange the fondant numbers on the front center of the jerseys and press gently to attach. Use the blue frosting to decorate the jerseys such as adding v-neck and stripes on the sleeves and on the bottom. 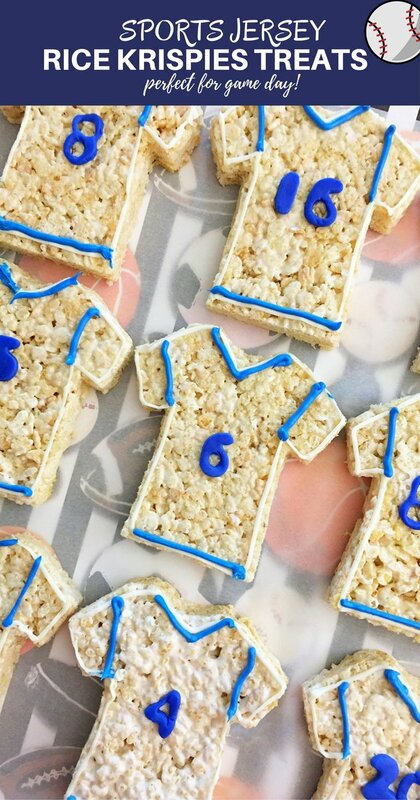 These Jersey Rice Krispies Treats are as much fun to make as they are to eat. Decorate them and add details as you like. Swap the blue and/or white for your team’s colors. Or move the fondant numbers on the back and pipe some “buttons” on the front to mimic baseball jerseys. 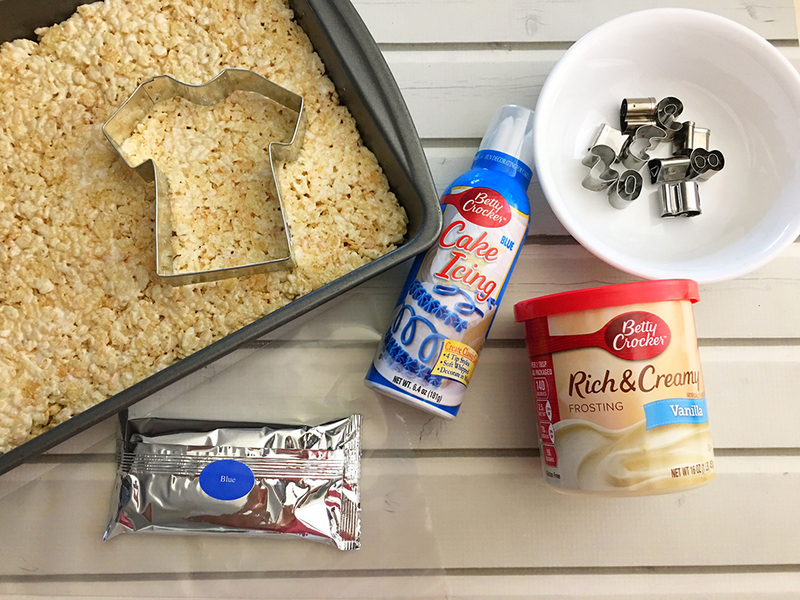 Make sure to get the kiddos involved, these Krispies treats are the perfect activity for little hands! 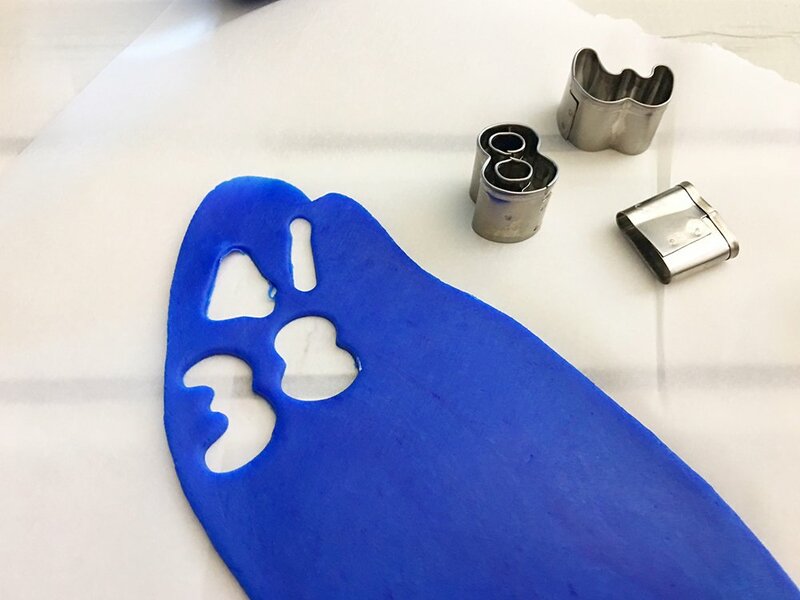 You can find the materials you need at your local craft store or you can buy the sports jersey and mini number cutters (these are affiliate links) on Amazon for convenient delivery. 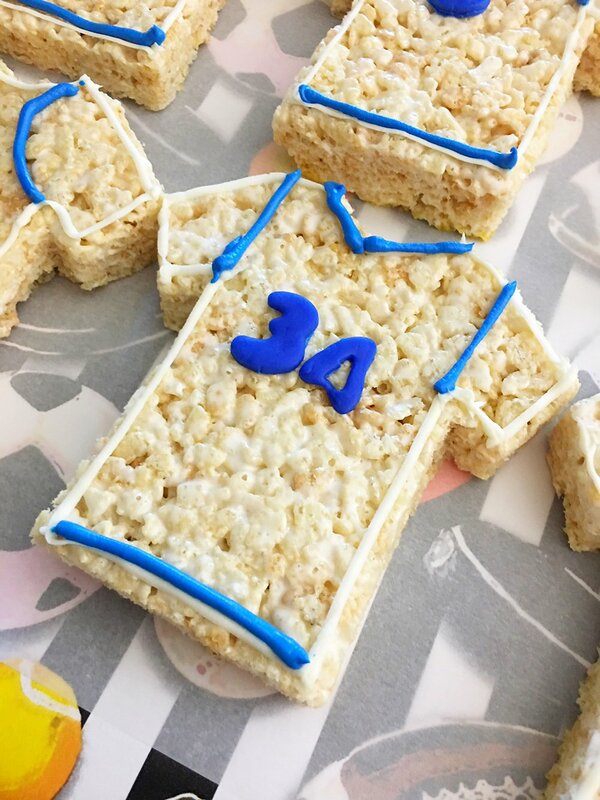 Sports Jersey Rice Krispies Treats are the perfect dessert or snack for a game day party. They're as much fun to make as they are to eat! Grease a 9 x 13" pan with butter or a nonstick cooking spray. In a large microwave-safe bowl, combine your marshmallows and butter. Heat for about 1 to 2 minutes or until the marshmallows get puffy and then stir until well combined. Add the Rice Krispies cereal and stir until the cereal is evenly coated with the marshmallow mixture. Transfer the prepared rice Krispies treats into a greased pan and press it down on until firmly packed and leveled. Allow to set and cool for about an hour. 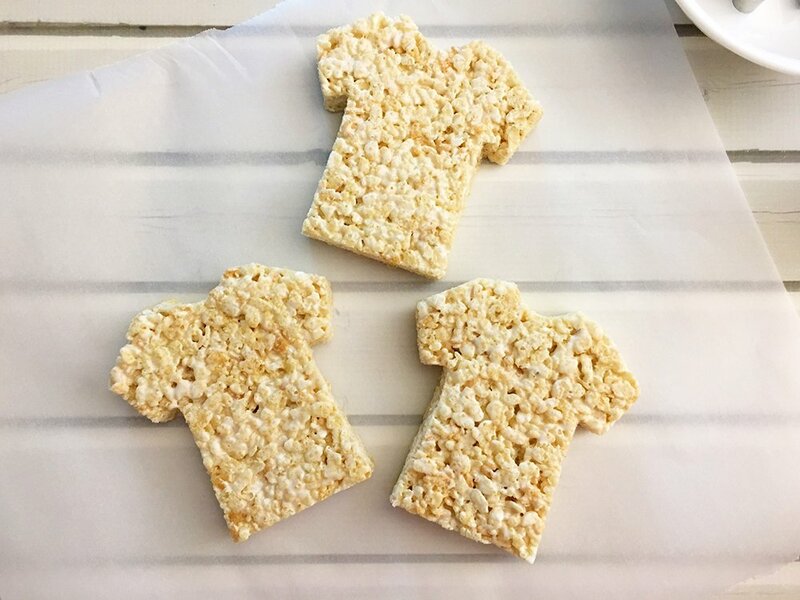 Using a jersey cookie cutter, cut the Rice Krispies into shapes and place on a flat work surface lined with a piece of parchment paper. Fill one decorating bag with vanilla frosting and cut a small tip off the end of the bag. 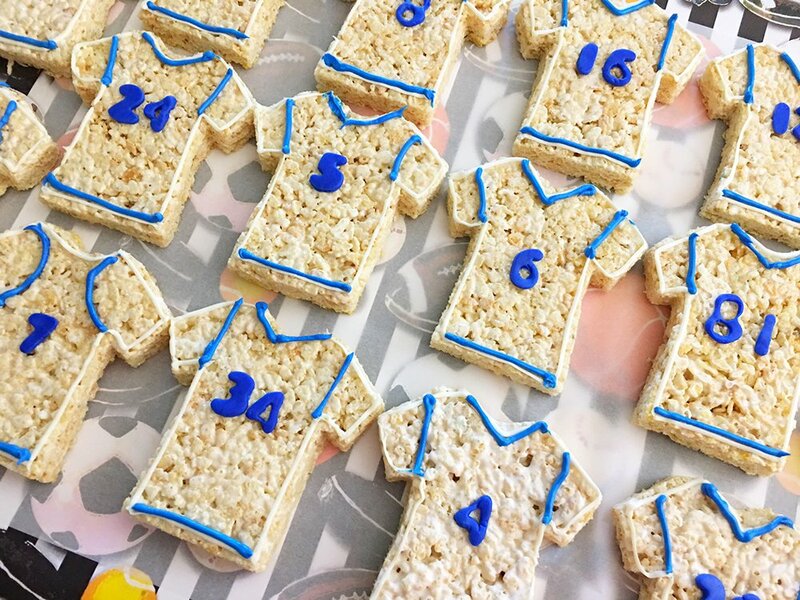 Outline the jerseys with the vanilla frosting. Nutritional facts calculated only for the Rice Krispies treat and do not include the frostings and fondant. OK. These are the cutest! What a great idea for a party (though admittedly I’m not much into sports but I might just have to show up for the treats!). Oh, thank you! I don’t have the patience for decorating, too, but they were actually easy and fun to make. i like the creativity behind this jersey treat..and looks so yummie wish i could have it now. These are so cute! And I love how easy they are to make! Plus they can be personalized for any team, any sport!!! Superbowl parities, world series or even the world cup!